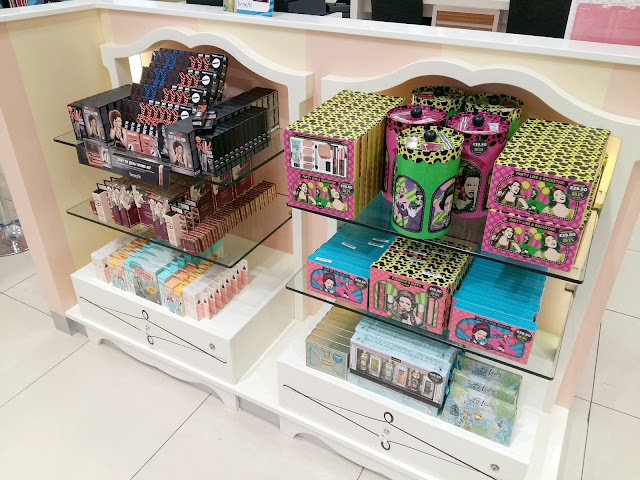 At the beginning of October an email popped into my inbox inviting me along to see Benefit's new boutique in Debenhams in the Bull Ring, Birmingham. I RSVP'd to confirm my place and headed over there on 22nd October. I'm afraid taking some pictures was pretty much an afterthought before we left and these were taken on my phone, so they're probably not the best. Although the Benefit boutique is new to Debenhams I don't believe it's brand new, I believe it may have been there for at least a few weeks. 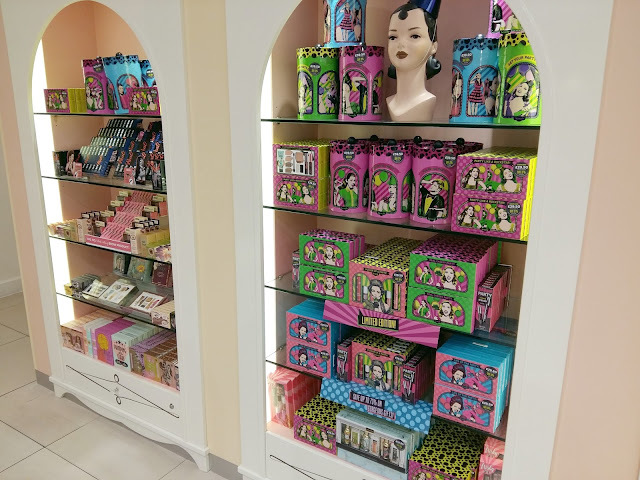 I don't get over to Birmingham very often (even though it's only an hour from me) but if I remember correctly one of the Benebabes said it was originally in John Lewis, or a similar large store in the centre of Birmingham. 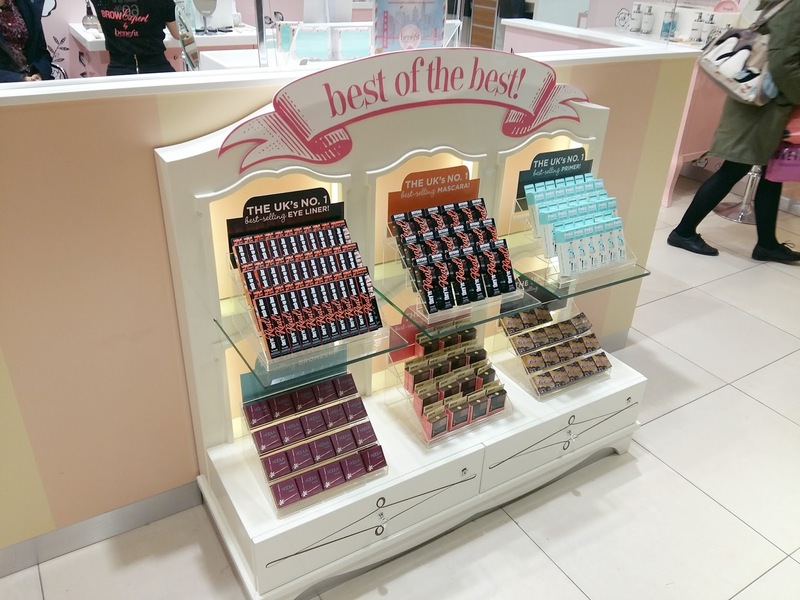 The store rebranded their beauty hall so all of the concessions had the same simple look, no matter what brand they were, and as I'm sure you're aware that's just not Benefit! So they moved over to Debenhams so they could continue being bright, girly and gorgeous. When I arrived straight away I was asked what makeup look I'd be interested in trying and was popped on a stool for a Benebabe to give me a little makeover. I think I went for a day look (I can't actually remember now!) and the products used on me included the new Air Patrol eye primer, They're Real liner, and They're Real coloured mascara. I'm a big fan of They're Real mascara and have used it in the past but Air Patrol and the They're Real liner are both new to me. During my makeover I did ask about my favourite BADgal mascara in plum and was told it's now been discontinued. I'm so disappointed! When I received the email about the event we were offered one free service with the choices being a brow arch and tint, a spray tan or a body treatment. As I've been growing out my brows all year and have been desperate to get them shaped for months I went for the arch and tint. I had no idea Benefit offered services such as spray tans and body waxing but the Birmingham boutique has two rooms to one side; the very pretty one pictured below for waxing and another plainer room for spray tanning. I don't know if these services are offered at other counters/boutiques across the country? As soon as my makeover was completed I headed over to get my brows sorted. This was my first time having my brows waxed, so I was a little nervous, and although it did sting a little it really wasn't too bad. This took a while to do but the Benebabe that tended to my brows for me talked me through everything and said I was doing very well for a virgin waxer (gold star for me!). I can't believe how good they look now their shape is no longer caterpillar! The only issue I've had since having them waxed is that the skin around my brows did dry out afterwards, but this isn't unusual for me, and I also had a few spots where I was waxed. After my tint I would say my brows are possibly a bit too dark for me, but that may well be because I'm just so used to them being quite light as I'm naturally blonde. I have recently tinted them myself at home but I was quite cautious and didn't go too dark. After my brows had been transformed I was then lead away from the counter and taken to Chi Kitchen where an amazing Asian buffet had been laid out for us featuring sushi, spring rolls, calamari and other amazing dishes. I had no idea this was going to be part of the event and I love Asian food, so this was a lovely surprise. I believe Chi Kitchen is technically in the beauty hall and is tucked away in a corner, so it might not be one you'd necessarily spot, but I'd definitely recommend hunting it out. After filling our tummies we all realised we hadn't actually taken any photos (hence why there's none of the buffet, we just tucked in!) so we headed back to the boutique to have a look round and take some snaps. My local counters where I live and where my boyfriend lives are both quite small, with just one double-sided display, so the Birmingham boutique felt massive to me. One thing I noticed about all of the displays was just how neat and tidy they were and there wasn't a single product out of place or missing. Obviously all of Benefits Christmas gift sets were also out in force for eager and organised Christmas shoppers. This years packaging is probably not the most Christmasy but it's certainly very bright and eye catching. To be honest I haven't actually checked any of the sets out yet, so I don't know what's included in them this year but there are plenty of them so there should be something for everyone. I would have loved to have treated myself to a product or two that I'm lusting after but money is a little tight at the moment so I was very restrained. We were kindly given a goody bag though that contained mini samples of the original Porefessional* and Porefessional License to blot*. I already know I'm not a fan of the Porefessional primer because I don't like silicone primers, but I'm looking forward to giving Licence to blot a try and am hoping it might work miracles on my oily chin. 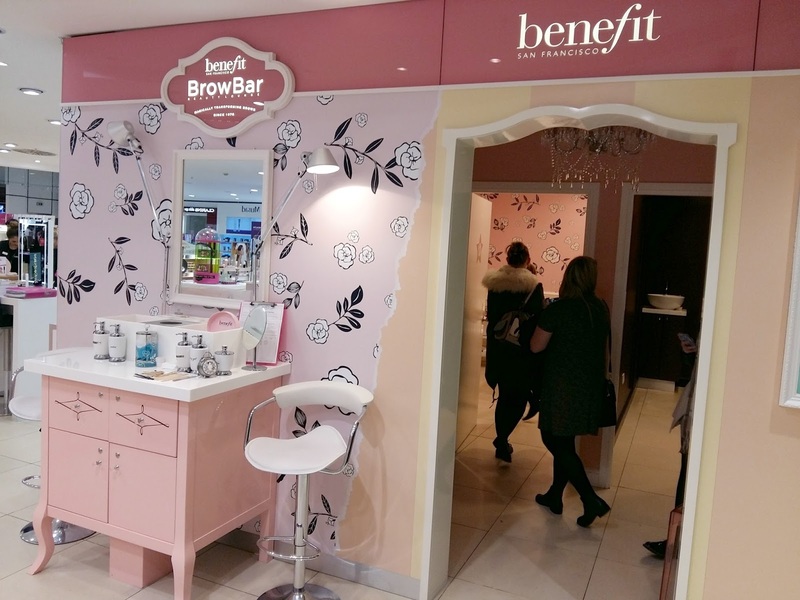 Thank you to the Birmingham Benebabes for inviting me along and for my new brows. If you're not local to Birmingham you can hop on over to the Benefit website to locate your local store and of course you can order online. Are you a fan of Benefit?